John Spyers (sometimes Spyres, Spiers or Spires) was the nephew of Joshua Spires (sic). He or perhaps Joseph, John's father is first recorded in Twickenham in 1729 in the Churchwardens' Accounts. Joshua was referred to as a Nurseryman in the Manor Court records. John's father may also have been a Nurseryman. John appears himself to have started as a nurseryman, possibly working in his father's or uncle's business. Referred to as "Mr Spyers", one of them supplied trees to Horace Walpole for Strawberry Hill in November 1748 and then prepared a survey of the place in 1750. 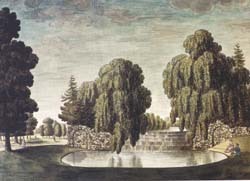 In 1765 John was engaged, together with Samuel Lapidge by "Capability" Brown to assist with the preparation of garden designs at Hampton Court. He was already associated with Brown, being described as "Mr Brown's Surveyor", working at Tottenham Park in 1764. When he died, in 1798, he was described as "Surveyor of Hampton Court". He had married Elizabeth and there were five children of the union: Joshua, Mary, Elizabeth Anne, Louisa and Anne Amelia. Elizabeth died in 1803, being described as "of Hampton Court", so it is possible that they actually lived there for some of the time. There is no reference to their baptism, marriage or burial in the registers of St Mary's Church in Twickenham. His work at Hampton Court is marked by the two volumes of drawings of the palace which have recently been rediscovered in the Hermitage store at St Petersburg and which were originally acquired by Catherine the Great. These drawings, which include Bushy Park, other places, landscapes and even sketch portraits appear to have been put together as a collection by John Spyres for commercial reasons and to advertise his capabilities. He was still drawing in 1784 when four engravings of Hampton Court Palace were published under his name, and in 1786 when aquatint views of Burton Lodge, and Colne Lodge (previously the residence of Paul Whitehead) in Twickenham were published. His drawings of Twickenham Park, Twickenham Meadows (Little Marble Hill) and Poulet Lodge (Dr Batty's) were engraved by Wells in 1784. Grosvenor House, Holly Road, Twickenham. 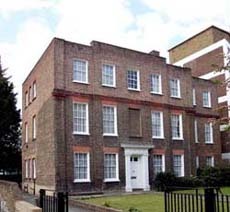 At this time he was recorded on Samuel Lewis's map of 1784 as living in Grosvenor House, a surviving substantial property just north of the Holly Road burial ground in central Twickenham. He inherited the property in 1767 by his uncle's will and he may then have moved in. It had been leased from 1750 until this time to Charles Fitzroy Scudamore. The property was in the ownership of the family at the time of the Enclosure Act of 1818. The owners then were listed as Joshua Spyers, Mary Mitchell and Louisa Ann Spyers and it was a substantial composite demesne: the house and garden covered over 2 acres, there were two adjoining houses with gardens and two market gardens extending in total to over 5 acres (entries 193, 211-214). Mary Mitchell was widowed and it may have been she who shared no1 Sion Row with Matilda Hawkins and her brother Harry, as noted by Cobbett. John Spyres had owned a property in Sion Row at his death. Writing in 1927, Paget Toynbee speculated that the trees Mr Spires delivered to Strawberry Hill in 1747 came from "the nursery next to Mrs Clives" which Walpole bought for £300 in 1773. However, it can also be suggested that they actually came from the family's nursery adjacent to Grosvenor House. John maintained a connection with Strawberry Hill: he is recorded in the Book of Visitors as bringing 3 people to see the house on 10 July 1784 and sending 4 visitors on 24 July 1792 and 3 July 1794. Some of this information has been deduced from the Court Books of Syon Manor which contain numerous references to land transactions through the period 1763-1820. Earlier volumes have yet to be consulted. The three brothers, Joshua, Thomas and Joseph (there were two other brothers: Christopher and James) acquired land and property in various parts of Twickenham. They seem to have worked together and even exhanged land from time to time. This was inherited by the four survivors of their six known children. Some of their land was to the east of Twickenham in the area of the modern Crown Road, some just north of the town towards the Crane River. A Mr Spires, possibly Joseph, first paid Church Rates for "Coles land" in 1729. By 1737 he was paying for several parcels of land and, possibly, a tenancy of Heatham House, across the River Crane on the Whitton Road, which in 1736/7 had been sold by John Cruikshank to Stephen Cole II. This land came into the hands of John and was inherited by his three children. Joshua's first wife, Elizabeth, though described only as "the wife of Joshua", appears to have died and was buried on 30 April 1740. He re-married, a lady called Mary, who survived him. There were no children surviving, hence Joshua made his will in favour of his nephew John. He was a Churchwarden at St Mary's in 1748 and 1749. In 1756 he took a lease of the Manor House, gardens, park and adjoining properties from Robert Gapper. After his death in 1768 his brother Thomas's widow, Loveday, continued to hold the lease though sub-letting parts of the estate to eight tenants. Joshua's brother, Thomas had a family: Thomas junior, Sarah, Mary and Richard. Thomas junior predeceased him, Sarah married William Vincent of Roxbury in 1772, Mary did not marry and apparently went to live at Thornbury in Gloucestershire. Richard lived in Isleworth but in about 1765 he went abroad and was never heard from again. So Mary became his principal legatee. Land Tax Records for 1767 suggest that Joshua came to own a house later known as High Shot House, in Crown Road. He apparently inherited this property from his brother Thomas, possibly in trust for Thomas's daughter Mary. She was admitted following his death in 1768, disposing of the house to Samuel Shuker in April 1789. Mary does not appear to have married: in 1792 she was living in Thornbury, Gloucestershire. She died in 1802. John had inherited much of the Twickenham property from his uncle, Joshua. He made his will on 24 August 1771, leaving everything to his wife Elizabeth so that she might bring up their five children, together with any further children they might have. This will stood for 27 years, with the addition of a codicil dated 19 April 1798 until he died later that year and was proved on 24 January 1799. The codicil provided for his five children to inherit his property: Joshua, Mary (Mitchell), Elizabeth, Anne and Louisa Anne (or Alice?) after the death of his wife Elizabeth. In the event of Elizabeth dying during the infancy of his children, John appointed his friends John Noble of St Martins Court and Francis Noble of Holborn, both librarians as administrators of his estate. In his codicil, they both having died, he substituted his “good friends Mr William Noble, late drawing master of Great Russell Street, Bloomsbury and Mr Edward Noble of Charlotte Grove, Lisson Green, late Drawing master" as his executors.